Michael Jackson’s sisters Janet and Rebbie and brothers Tito, Randy and Jermaine Jackson claim that his estate executors John Branca and John McClain faked Michael’s last Will and Testament prior to his untimely death on June 25, 2009. Michael’s family are demanding that these men immediately resign their executorship of the Estate. Any doubts about the validity of Michael’s will and his selection of Executors were thoroughly and completely debunked two years ago when a challenge was rejected by the Los Angeles County Superior Court, the California Court of Appeals and, finally, the California Supreme Court. Under the supervision of Los Angeles County Superior Court Judge Mitchell Beckloff, Co-Executors John Branca and John McClain have diligently carried out their fiduciary duties as well as their obligation to Michael to make sure that his Estate benefits the only family members he named in his will – his mother and his three children. We are saddened that false and defamatory accusations grounded in stale Internet conspiracy theories are now being made by certain members of Michael’s family, whom he chose to leave out of his will. We are especially disheartened that they come at a time when remarkable progress has been made to secure the financial future of his children by turning around the Estate’s finances as well as during a time when so many of Michael’s fans, old and new, are enjoying his artistry through exciting new projects. Wow, Michael must be so sad to see the fighting that still continues. I feel bad for his family and everyone who loves him. All I know is that I miss him more than anyone in my life. I hope things can be resolved quickly and without too much conflict as I am very concerned to hear of the negative impact this is having on Michael’s mother’s health. She needs to have peace in her life and not be thrown in the middle of a legal battle. I’m also concerned at the negative impact this will have on Michael’s childrens emotional well-being (boy, I don’t want them to have to suffer another tremendous loss of someone they love so much – thinking of Katherine- this much stress at her age -she suffered a “mini-stroke”? !- this causes great concern). I questioned the validity of the will due to the misspelling of names and the date the will was signed, MJ was in NY, not Los Angeles as it says. A second will has not been located, and I think the battle over the will has already been fought and decided upon. While MJ was alive, he always gave money to his mother on a regular basis, made sure she had a place to live and paid the normal household bills. If she chose to let all the other “cubs” live all in one house with her and her pay their living expenses…it was her decision. But, MJ himself never felt obligated to give money to his siblings or Father. It is the same way with this will. His children get x amount of dollars a month and Katherine gets x amount of dollars per month. The problem is as follows and it’s a huge and Greedy problem—When Katherine dies, their money ends. Katherine’s money is added to the childrens money but the rest of the Jacksons may have to fend for themselves. I fear that if Katherine dies, the Jackson’s won’t want it to be known by anyone because the money will stop for them at that time. MJ was a smart man, and there might be a trust for some money to go to a few other Jackson family members but I’m not sure. So, this will does seem to be just an extension of the way MJ distributed money during his life. So, the family will want to keep Katherine alive for as long as they can even if she is brain dead and on life support…for the money. I don’t think MJ ever thought his mother would outlive him and that if he died, his children would be raised by Diana Ross if she agreed to do it. MJ fully understood how his family functioned, and I personally don’t think MJ ever wanted his children to live around Joseph or the other siblings, cousins and family members. Maybe MJ did change his will fearing that his children might end up influenced by his family members but we don’t have another will, and that is the problem. If he did have another will, I think Peter Lopez had it and he’s dead…of course, the authorities say it was suicide (shot in the head in his front yard), but his family claims he would never do that. I don’t think there is a choice. But as Katherine ages and declines, Jermaine and the others will be scrambling to change the will and to make sure they get money. It’s all about money. MJ owed them nothing at all. What a sad situation. I had no idea this was going on. I hope Katherine will not have to waste the time she has left on legal battles . In the end all the money in the world means absolutely nothing. I wish her strength and many more years. I don’t understand this…on one hand I think the estate executors are doing a good job and it was the family that was getting into some shady deals but also am wondering surely the family must know something and there are real inconsistencies wrt will. Do u hv any opinion on this Seven? “Are you infected with the same disease of lust, gluttony, and greed?” I think we all know which song those lyrics come from. In my opinion, Michael didn’t owe his siblings anything, and Katherine and the kids are his rightful heirs, regardless of possible tampering with the will. He gave his family plenty during his lifetime, beginning as a child and continuing for decades. Why do they feel so sure he would want them included in the terms of his will? If they had any class, they would express gratitude for their incredible good fortune in having this extraordinary man as their brother. Thank you for sharing this information, Seven. @cjg, Paris Jackson tweeted today that the “mini-stroke” did not happen, calling it a “rumor” and that Mrs. Jackson is fine. Others then tweeted to Paris that her Uncle Randy (as a signatory on the letter, and the first of the siblings to confirm its authenticity) was the one who made the claim of a mini-stroke. IMO, if the Jackson siblings do not stop this nonsense, they will cause more emotional and physical harm to their mother than the estate executors ever could. Mrs. Jackson and Michael’s children are more than adequately provided for by the executors. Jackson siblings, seriously, STOP! 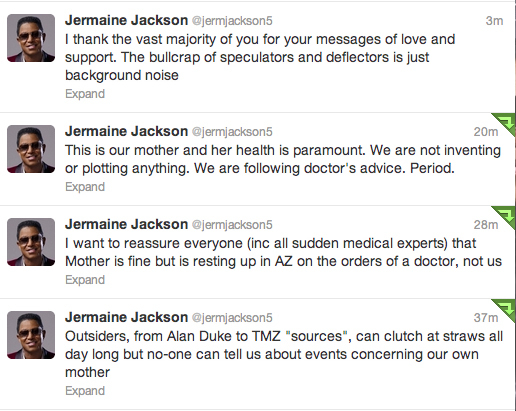 It’s not the family who are hurting Mrs Jackson or Michael Jackson’s memeory. Why shouldn’t they speak up about clear fraud? Unfortunately, a circle of greed still surrounds MJ’s assets. It will never be exposed. As long as the family are portrayed as greedy parasites no-one will take their claims seriously. Just as no-one took Michael’s claims that his life was in danger seriously. How did that turn out again? The way things are going in that family i wouldn’t be surprise or shock if PPB emancipate themselves when their grandmother passes on from the family. It looks to me that the lawyers are trying to spin this as a greedy grab by disgruntled siblings left out of the will. Janet signed the letter, and it certainly isn’t about money for her. The letter is clearly challenging the control that Branca & McClain have taken over the estate. Decisions about control of the music, and Michael’s artistic legacy as well as his assets, by people he fired and tried to excise from his life. Look more closely at the timelines of how all the lawyer/executive piranhas positioned themselves before and after Michael’s death. All that swirled around him during his life, and swooped in at the end. The letter contains very revealing anecdotes: the signature page of the will was not produced until days later? Branca tells Katherine right after Michael’s death, “I AM MICHAEL JACKSON NOW” -? Michael told them all in the months before he died that he wanted nothing to do with Branca & McClain? The letter also discloses that Branca & McClain are paying off Katherine’s own advisers so they will convince her to accommodate terms of a will she knows to be fraudulent? and to undermine the wrongful death lawsuit against AEG, the strain of which is really what’s harming Katherine, not this letter. Branca & McClain consistently say that everything they do is on behalf of Katherine and the children — as if they have no self-interest. Right. I am not qualified to comment on the subject matter of this post. What saddens me is that a child (Paris )is tweeting about these serious Family matters . Yes, tweeting can be fun , but has nobody explained to her that Family feelings and upsets are for Family to deal with, not to be discussed with the rest of the world and total strangers willy nilly. There will be plenty out there who will make a meal of this as it is, without any extra help in regards to internal friction. But I will speculate that Michael would be heartbroken to see his daughter behaving in this manner. Please don’t misunderstand me . I think she is a beautiful , lively and intelligent girl, and a credit to her Dad, but at present seems to lack the guidance he would have continued to give her. I believe he was well aware of the additional chalenges his children would have growing up, simply because of who he was. 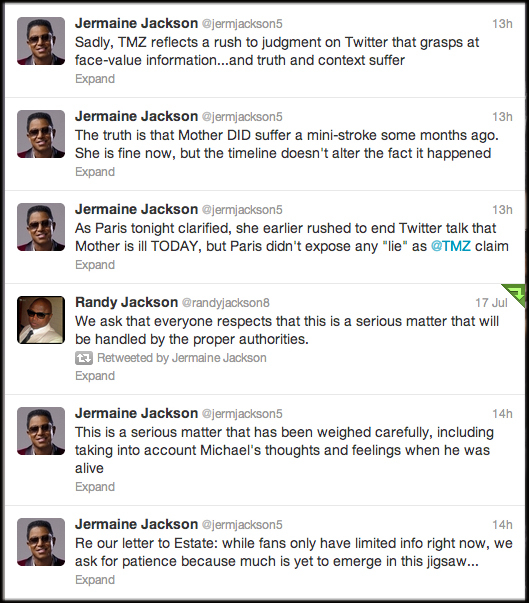 Please take care Paris, …..the vultures out there won’t make any allowances for you… you are part of the Jackson Family, so there is always another layer to everything you do, which I’m sure you have already found out during the last three years or so. I am terrified to think that if the Estate will no longer handle Michael´s finances, who will? Jermaine? God forbid. And Paris dismissed that her grandmother had a stroke, and this was ugly to the brothers. Did they lie? Maguk, I agree with what you wrote so much. I believe that Paris should not be allowed to have a Twitter or any social media account just because of the fact of who she is – the price of fame! I do so worry about that girl. I knew she was the tough one (probably comes from her mother’s side) but she has no clue what she is in for – people are so cruel – they do not care that she is really just a child. Prince certainly has had no public outings since I believe maybe the Tribute concert in Wales? Or was the event in Germany after that……I think he learned a hard lesson about how cruel this world really is and I am sure his father tried to tell them that. Michael Jackson’s fan base is aware of derogatory statements made by certain members of the Jackson family, against the executors of his Estate. We are shocked and saddened that propaganda, rather than seeking avenues to address their concerns legally, have been used to gain sympathy. While we most certainly support the beneficiaries of Jackson’s Estate, Katherine Jackson and Michael’s children, we equally support the executors, Mr. John Branca and Mr. John McClain. Jackson’s fans understand that the task both Branca and McClain took on when Michael died was staggering. Weighted in nearly $400 million in debt, with an overwhelming amount of pending lawsuits, the Executors took the reins of the Estate and went to work. Posthumously, the Executors have ensured the highest grossing music documentary of all time, This Is It, two successful albums, the number one tour in the world, Cirque du Soleil’s IMMORTAL, sold millions of Michael Jackson The Experience video games, and are planning a huge release for the 25th anniversary of Jackson’s legendary Bad album. Although every fan does not agree with all decisions the Estate has made, we agree that overall, the Estate has done well in preserving Michael’s legacy. In addition, we agree with the Estate, that “false and defamatory accusations grounded in stale Internet conspiracy” do nothing to promote the positive ethic Michael Jackson espoused while alive. In three years, Jackson’s Estate is thriving, nearly debt free and Michael Jackson’s music is still at the forefront of the music industry. We wholeheartedly support Michael Jackson’s final wishes; that he trusted both John Branca and John McClain to continue his message through his music. The Michael Jackson fan base thanks the Executors for continuing to do just that, with grace and dignity. Note to fan groups: Please sign the letter and post it at your websites,blogs, forums, facebook and twitter accounts. Notify us and we’ll add your name to the list. Note to individual fans: Please post the letter at your blogs, facebook and twitter accounts and help with circulation of it. I won’t tell any of my readers which side to take, nor become involved in arguments over it. You are all adults and can make up your own minds. I’m just sharing the information. Additionally, the different fan groups on either side of this issue may conduct their war with one another elsewhere. The comments section on this site will not become a conduit or forum for insults, bullying or harassment of other fans about this. I doubt the family would handle the estate if the current executors were removed or resigned. Likely a different law firm would do it. But I don’t know, just guessing. As the fan off Michael i trust more his family specially Janet than any estate attorneys. If the family got some proof about the fraud why can t they challenge it??? Seven, here’s a video compilation of the media’s coverage (so far) of the Jackson family’s feud with the Estate! When Paris spoke out at her fathers memorial I admired her courage and wished Michael had had a little bit of her boldnes. Now I wish she had a lot of his meeknes. What more proof do people need that Its unhealthy for a 14 year old to have fans and followers only because she is Michael Jacksons child. She should take her fathers example, be humble and work hard at her skills, so she can have something of her own to offer. One thing she has proven that she cannot yet handle the freedom of social media . My loyalty to Michael and his family goes back way before june 25th like most of my generation. And I have no reason to trust anyone in a powerful position , quite the opposite . Rupert Murdoch and Bernard Madoff come to mind . Yet there is no way I would support something that I have nothing to do with and dont know the details of. Its like we landed in a kafkaesk scene and everybody has lost their mind. People should get a life asap. What is really worth adressing is the marginalizing of MJ and his artistic importance. This is what someone wrote. Up until 2010, I was in love with the National Museum of Dance and Hall of Fame. 2010 ruined it for me when the boneheaded board of directors chose to induct Michael Jackson into the Hall of Fame. Yes, MJ was a great entertainer, but the Hall of Fame and Museum is NOT for pop icons it is intended for the preservation of the history and fostering interest in CREATORS OF DANCE. MJ did not choreograph. He performed other people’s moves. While I am sure that Ruth St. Denis, Ted Shawn, Martha Graham, Jose Limon, and Bob Fosse would have been highly entertained by MJ, there is an enormous contribution gap between what the aforesaid contributed to American Modern Dance and what MJ contributed (MJ contributed exactly nothing to American Modern Dance, he was a pop culture icon). etc,etc. That’s a pretty snotty comment someone left at the Ntl Museum of Dance about Michael! Not everyone loves MJ but to deny his artistic contribution to the field of dance is pretty ignorant. I’m sure the Museum gained many more patrons than it lost by inducting Michael, though. I wish that Paris had listened to her Aunt Janet about the acting stuff and was horrified at these kids being ‘public’ figures after their Dad was gone, but it’s not our decision to make. And overall, I think she’s handled herself exceedingly well. I do know (I remember) that teenagers can be very stubborn when they want something though! Like everyone (including Paris, no doubt), I certainly wish their Dad was still here to guide them. Evidently, according to Jermaine, Katherine had this supposed mini-stroke months ago and is fine. However, he says the have taken her away to a place in Arizona to rest according to doctor’s orders. Why would this be ordered months after the medical episode and if she is fine today. I wondered if they haven’t isolated this poor woman to try and manipulate and pressure her to do what they want as far as pursuing the challenging of the will. Who is watching and caring for the children in her absence ( SHE is the legal guardian no one else)? I have to say I agree with Joyce about the motivation for challenging the will. As I have always believed that Michael knew what he was doing and want he wanted concerning the care of his children and limiting contact with his family. He made sure his children had limited contact with the family and that they had many and varied international relationships with people he was friends with when he was alive. I’ve often wondered if the children are allowed to continue to have contact with these various people they grew up with in their lives or if it was abruptly ended as it seems they’ve only been allowed to socialize with family. I think it’s in poor taste and disrespectful to Michael’s wishes to behave they way they are. Yes, I agree. This person should have read what the famous dancer Barishnikov said about Michael, that Michael did not need any lesson from him and that he was a juggernaut on stage. Barishnikov would completely agree about Michael being inducted to the Museum of Dance. Michael never had dance lessons and he could dance anything. Just remember Thriller and what Michael Peters said about him. The other 18 dancers have had dance lessons for years and years, and Michael just watched and did like or better than them and M Peters was astonished and said that he was a dancer in his soul. He could dance and tap dance without copying anybody and he did not copy he just had them as models and he outdid them, that´s the truth. Seven ,you are right about Paris’its not up to us. Its unfair and must be confusing for the child to hear all these opinions expectations and advices from strangers like myself. The dance museum I hope to visit next month. And its true, if it wasnt for Michael I would not even have know about it. This person has a very narrow minded view on dance and influences. To say that MJ contributed nothing at all is crazy. It did trigger me to have a look into Michaels choreography. I couldnt find books on the subject, dont know if there is anything written about it. Well, that person is entitled for her/his opinion, even when it´s full of ignorance ! No longer going to the NMDH because of such misinterpretation of MJ is her/his loss ! Love you Michael for ever!!! I have no doubt the will is fake & that John Branca was ever rehired by Michael- noone would rehire someone after hearing that he worked behind his back with Sony. If you have faked a will, what else have you done? Weitzman is shady as they come- he was or is involved in Doris Duke’s estate, hired Pellicano, was Pellicano’s lawyer for a time, involved in Cobain’s estate. McClain has many conflicts of interest. As far as Paris knowing whether her grandmother had a stroke? They most likely would not want her or any of the kids to worry & probably never told her. We do that in my family. We need to get to the bottom of everything!!!!! Beth Karas says the Estate receives 10%, but I read it was originally 5% and then was increased to 7% as a result of approval from the court handling the Estate. Also I read that this amount does not include certain things, like revenue from This Is It. Hmmm. Beth K. says the Jacksons who signed the letter have no legal standing to challenege the will. This makes sense as Joe had the same conclusion reached in his attempts to challenge the will. When a reporter says my ‘source’ says this or that–how can we know the source is telling the truth? I guess we can’t. I’ve never seen any books written specifically about Michael’s dancing. Of course Joe Vogel probably has the best books about his artistry and creative process in general but I’ve never seen one just dealing with Michael’s dancing. I think such a book would be fascinating though! I agree. The person who doesn’t appreciate Michael’s dance artistry – his/her loss! I believe everything that was said in this letter. It doesn’t sound to me at all like the siblings are gold-digging, rather, they are displeased with how Branca and McClain have carried out their duties since Michael died. Those little things that Branca said and did, they couldn’t have made that up, and note that Branca did not deny saying or doing any of that. Branca is certainly not above buying people out, just like Sony bought him out. I doubt that the siblings can win, but I sure want to see them give it a helluva good try!